To sign up to any of our events please Contact us with your name and the event you will be attending. The calendar above shows scheduled events from the Worthing Archaeological Society and associated local organisations. Click event on calendar for further information. To filter the type of the events shown, use the drop-down arrow on the top-right of the calendar. For lectures, members have free entry and visitors are asked to make a donation of £4 to the society. For excavations, a day membership can be purchased for £5. This talk will consider the challenges of archaeological salvage, restoration and the rebuilding of The National Trust property Clandon House in Surrey after the devastating fire of 2015. Tom is the Regional Archaeologist for the National Trust and archaeological adviser for the project, which has been using a combination of excavation and advanced survey techniques to document the structure and learn more about its history and development with a view to future restoration. Indigenous and imported building stones have been recorded in 316 Medieval churches in Sussex, including Chichester Cathedral and a number of ruined churches where building stone is still visible. This lecture concentrates on the building stones of 55 Medieval Parish churches in the Worthing area, covering 4, 10km grid squares, which includes the area between the Rivers Arun and Adur from the coast to the southern margin of the Low Weald. The course will concentrate on the identification, production and use of pottery found in West Sussex, from the last decades of the Late Iron Age and throughout the Roman period (c. 10BC until AD410). Using presentations and handling, the most common types of pottery will be studied with the aim of differentiating between local, regional and imported pottery. To be held in The Education Room at Worthing Museum, 10 am to 4 pm. WAS Field Unit will be returning to the Malthouse Field in Sompting. To volunteer for surveying, excavation or finds-processing, please use the contact form below. The day will be held at the idyllic Downs Barn, Sompting between 10am and 4pm. We will look at food and feasting from the days of Homo Neanderthalensis to the Late Medieval/ Early Tudor period and will consider the relationships between food and social culture. We are hoping to try out some ancient recipes, however there will be the normal mid-morning coffee/tea breaks provided and please bring a packed lunch. Cost for the day £25 for members. To be held in The Education Centre at Worthing Museum. Hog Croft is a pasture adjacent to the medieval Church of St Wulfran, Ovingdean. BHAS have conducted investigations in this field since the 1990s and these culminated in a four year dig from 2014 to 2017. The field is rich in archaeology and has long been thought to be the site of a Norman manorial complex. The recent excavations revealed evidence of an earlier Saxon community. As well as large amounts of pottery and bone the site has also given up some intriguing objects of special significance. A 1.5mile walk, guided by the Worthing Heritage Tarring Trail leaflet. To finish up at a hostelry in High St., Tarring. There are almost seventy islands in the Orkney archipelago, mostly formed by rocks of the Middle Old Red Sandstone. This stone splits easily along clear bedding planes and presents little difficulty in quarrying, and has been used for building purposes for the last six thousand years on the islands, and helped in the preservation the archaeology. The talk will discuss monuments of the Neolithic period, looking at the development of the various chambered tombs, domestic settlements, and the ceremonial heartland of Orkney, including excavations at the Ness of Brodgar. Jon Sygrave is the Project Manager of Archaeology South-East (Centre for Applied Archaeology of the Institute of Archaeology at University College London). The Flint Mines in Sussex are the earliest in Britain with many of them situated within easy reach of Worthing. Jon has recently led the reassessment of the early Neolithic Whitehawk Causewayed enclosure which he will discuss along with the mines and other aspects of the Sussex Neolithic. Short walk up Mouse Lane to the historic Rifle Range site. The track is rough and the ground is uneven - so suitable footwear is necessary. How waterlogged preservation in archaeology develops our understanding of life and society in the past. For example, the thousands of perishable artefacts that were preserved and recovered from the waterlogged location of the Mary Rose are of immeasurable value as a Tudor-era time capsule. This day-school covered terminology, the development and construction of timber-framed buildings, the basics of building recording, how to approach dating a building along with a set of useful resources. The day ended with a group practical session using site photographs and plans to try out the knowledge gained during the day and demonstrate how a building can be interpreted. This was a special training day led by Bob Turner on site at our Malthouse dig. The training was divided into two sections, running concurrently: one for complete beginners and the other, for those who have already done some planning and section drawing to improve their skills. Bob gave instructions on both planning and section drawing making use of the dig’s open trenches, the very best place to learn. This was an ideal opportunity for both beginners and those with some knowledge to learn in a real archaeological environment. Dr Matt Pope is Principal Research Associate and Senior Teaching Fellow in Palaeolithic Archaeology at U.C.L. This is a Minibus Day Tour. ‘Adur: Source to Sea’ takes a visual journey from the sources of the river in central Sussex, through the broad plains of the Wealden clays and sands before heading south through the Downs and on to the Coastal Plain of West Sussex, ending its journey at the current river mouth. This talk looks at the geology, geography and history of this small but fascinating watercourse. Dr Matt Pope FSA MCIfA, Principal Research Associate and Senior Teaching Fellow in Palaeolithic Archaeology at U.C.L. The record of human occupation in Europe now extends well beyond a million years and involves multiple species of humans in apparently successive waves of colonisation, from the Near East, Africa and Asia. Europe has always presented challenges to early humans, forested in warm periods and intensely cold and seasonal in the cold ‘glacial stages’ it required adaptation by species initially more suited to open and lightly forested tropical grasslands. In this day course we’ll cover the archaeological record of successive human species: Homo antecessor, Home heidelbergensis, Homo neanderthalensis and Homo sapiens. We’ll explore the evidence for changes in behaviour including hunting, use of fire, processing organic materials and consider how the British record differs from that of other continental regions. The course will familiarise you with basic concept about climate and environmental change, stone age technology and latest theories surrounding human evolution. WAS members have the opportunity to take part in a joint fieldwalk near Fittleworth, West Sussex with Chichester & District AS. The field has so far produced a number of good quality Mesolithic and Neolithic flintwork.This is scheduled to start on Saturday, 17thFebruary and continue through to Sunday, 25th February, which is likely to be a much greater window than needed. With a good number of walkers and reasonable weather it should be completed in a few days but it does mean that days can be cancelled if the weather is dire. Rob Wallace and David Millum, the directors of the Culver Archaeological Project, will give a summary of their excavations of the Romano–British settlement at Bridge Farm, near Barcombe Mills, discovered in 2011 during a geophysical survey for Margary’s London-Lewes road. They will include a brief background to CAP as well and some initial thoughts about how this 1st to 4th century settlement fits into the wider context of south-east Britain in the Roman period and why it qualified for earthwork defences during the late 2nd century. The talk will cover the first 7 years of what looks destined to be a very long and regionally important investigation. Over the past 460,000 years Britain has been separated from Europe several times with the final split in 6,200 BC when the disaster of Dogger Land had a great effect into the Mesolithic peoples of that time. Recent discoveries by Imperial College London, operating from Littlehampton, have now been able to draw a picture of "what leaving Europe" meant in times past. The clothes, weapons and accoutrements used by a soldier in England in the 1640's in his daily life. I will also briefly cover the make up of the armies and talk a very small amount about battle tactics. The talk will be illustrated with (mostly) reproduction clothing and equipment and explanations of their use; there will be an opportunity at the end to examine these items more closely. Judie will discuss Place-names in the Landscape and how they were derived. Coffee and tea will be provided during a short mid morning break. 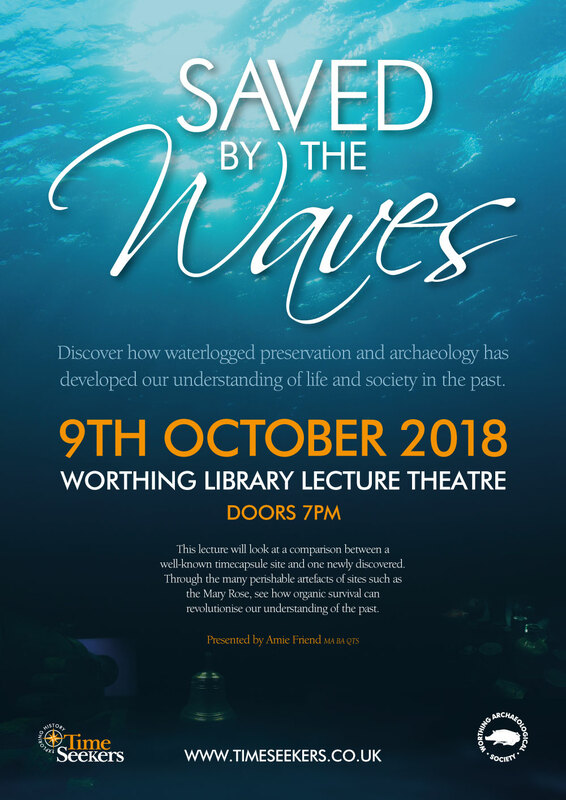 Worthing Library Lecture TheatreArchaeology is the key driver in uncovering evidence for Germanic settlement in Sussex during the decline of the Western Roman Empire. The historical documents are few and unreliable, though arguably should not be dismissed outright. This talk will look at some key 5th and 6th century Saxon burial and settlement sites in the county, along with documents, chance finds and new genetic research in an attempt to piece together the birth of the kingdom of Sussex. James will be bringing some finds from the Highdown Cemetery for handling after his talk. A 1.5 hour easy walk around historic Littlehampton. What was the immediate impact of the Roman Conquest in Hampshire and West Sussex? The lecture will highlight some continuation of Iron Age traditions and how they interplayed with incoming ideas and practices. It will also propose an alternative hypothesis as to why Fishbourne Palace was built. Study day: led by David McOmish: " Making Sense of Monuments: Landscape Archaeology of Sussex: The Bronze Age"
David McOmish, a Senior Archaeological Investigator with English Heritage and a leading British Prehistorian, has, among numerous other achievements, made several large scale landscape studies of the South Downs. Some of you may remember last year he gave us a wonderful study day which took us up to the end of the Neolithic. This day is likely to prove just as popular. Our Summer dig will be from Saturday August 5th to Thursday August 17th inclusive. This time we are going to look at an area in Rough Copse, West of Goblestubbs which showed up on the Lidar. Setting up/Surveying will take place on August 3rd & 4th, and Recording/Planning/closing the site on August 16th and 17th. This will be held in the beautiful venue of Downs Barn, Sompting. Bob will tell us about the uses of flint tools in prehistory and demonstrate how to make them, followed by practical sessions where we can try to make our own. New Years' walk and pub lunch - High Salvington to the Gun Inn, Findon.